It had been over 28 years -- from May 1983 to until September 2011 -- since a man from the Bahamas had played in the major leagues. When the Atlanta Braves called up Antoan Richardson, it brought another Bahamian outfielder back into the news. Wil Culmer's name remains prominent at home, but in the United States he is little remembered. He played just seven games for the Cleveland Indians in 1983 -- and after 1984, his pro career was finished. Culmer also died in 2003 at the untimely age of 45. This man’s impressive physique -- 6’4” and 210 pounds -- and righty power invited comparisons. He was likened to Jim Rice, since there was some resemblance in face as well as build, but Cito Gaston and Ryan Thompson also come to mind. Along with Tony Curry, “Sudgy” (as he was called at home) was perhaps the best slugger the Bahamas ever produced. He could also run and hit for average. Yet while Gaston and Thompson fulfilled just fractions of their promise in the majors, Culmer never advanced beyond the prospect stage. Cleveland sportswriter Terry Pluto recalled of Culmer, “He was a big, strong guy. . .with holes in his swing. He was a decent athlete who seemed to be trying to learn baseball. He had God-given physical ability, but the game did not seem natural to him.” As Pluto indicated, Culmer was not a good fielder. Pat Corrales, who knew him from both the Phillies and Indians organizations, allegedly once called him “allergic to leather.” Wil himself acknowledged that baseball was less advanced in his homeland. In the view of Fred Sturrup, a sportswriter and longtime observer of baseball in the Bahamas, “The game was popular here but not as advanced because of lack of multiple facilities and advanced training as compared to the United States.” Nagging injuries also hampered Culmer. Even so, at one point he was exciting enough that the Philadelphia Phillies put him on their 40-man roster ahead of future star George Bell. Wilfred Hillard Culmer Jr. was born on November 11, 1957, in Nassau, the capital of the Bahamas, on the island of New Providence. His father, Wilfred H. Culmer Sr., was a mechanic. His mother was named Phyllis Wilkinson-Ingraham. Wil was the youngest of three children, coming after older sisters named Yvonne and Donna. Young Wil (he often signed his name as “Will”) grew up in the Bain Town area. Originally this was a settlement “over the hill” from Nassau proper, founded by liberated Africans -- Yorubas from Nigeria, whose customs would long endure. Over time, though, the capital expanded and absorbed the little town in the bush. After high school, Wil “went to work in an import shop on Nassau’s docks at $100 a week, playing in the country’s only league.” Fred Sturrup called Colin Thompson (the older brother of NBA star Mychal Thompson) and Culmer “the two most prodigious home-run hitters in the history of the game here.” As Wil later noted, though, playing at home “may have slowed me down, because the situation could be better. If we had a system like they have in the Dominican, I could be further ahead.” So, in his late teens, the young man went to the U.S., briefly attending Chipola Junior College in Marianna, Florida. This program boasts several alumni who have made it to the majors; in recent years, the list includes Yankees catcher Russell Martin and José Bautista of the Blue Jays. 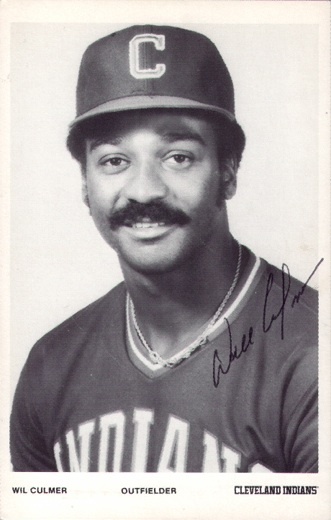 On October 25, 1977, the Philadelphia Phillies signed Culmer as a non-drafted free agent. The scouts were Andy Seminick and Paul Duval. Seminick, the catcher on the “Whiz Kids” team of 1950, was in the Phillies’ organization for decades. At that time, he was also the coach at Florida Tech in Melbourne, where he resided. Although Melbourne is on the Atlantic Coast and Marianna is nearly 400 miles away in the Panhandle, Seminick still covered a lot of ground in Florida. Wil started 1979 with Peninsula of the Carolina League, skipping a level to high Class A. It proved a little too much, though, as he went .150-0-7 and committed seven errors in 22 games. He had served mainly as a designated hitter in Helena, with minimal action at first base. Thus he spent the rest of the ’79 season with Spartanburg in the Western Carolinas League (“regular” class A). S-Phils manager Bill Dancy said, “I think he’s mainly here to work with Mel [Coach Mel Roberts] since Mel is the organization’s outfield coach.” Wil hit .307-6-46 in 68 games, but he remained very raw in the field, with eight errors and an .840 fielding percentage. In 1980, Culmer returned to Peninsula, where he had his best pro season. He was a Carolina League All-Star, winning the batting crown with a .369 average on a league-best 184 hits, as he hit a blazing .413 in the second half of the season. For the year, he hit 18 homers and drove in 93 men. He also led the league in runs (112) and total bases (276), while placing second in doubles (28) and third in homers. In addition, he stole 26 bases. However, appearing in 38 games at third base as well as 106 in the outfield, Culmer committed 27 errors. Yet his overall promise still led the Phillies to add him to their 40-man major-league roster that October. This decision factored into a big mistake, as Philadelphia left George Bell (then still known as Jorge) unprotected in the Rule V draft that winter. The Dominican, who was Culmer’s teammate at Helena and Spartanburg, missed much of 1980 with a bad back. The Phillies front office gambled that no one would notice, but Toronto scout Al LaMacchia saw a healthy Bell playing winter ball at home. Wil did pick up in the second half and wound up with a fair year overall (.282-10-53). That was enough for him to rise to Triple A in 1982. With Oklahoma City in the American Association, he enjoyed a similar season (.288-14-58). He saw occasional duty at first base. Culmer was a possibility for a call-up to Philadelphia in April that year after Mike Schmidt suffered a painful rib injury swinging the bat. He wasn’t deemed ready yet, though, so instead the Phillies shifted Iván de Jesús over to third base temporarily. To replace de Jesús, Julio Franco -- a shortstop in his early years -- got his big-league baptism. On September 12, 1982, the Phillies made a canny trade with the Indians -- one that “raised brows” in Cleveland, as Terry Pluto observed. General manager Paul Owens, “propelled by the excellent reports submitted by scouts Hugh Alexander and Moose Johnson,” sent pitchers Jerry Reed and LeRoy Smith, along with Culmer, to the Indians in exchange for John Denny. Denny had a poor year in 1982, as his shoulder was sore. In 1983, though, he rebounded to have the best season of his career. He won the NL Cy Young award and helped the Phillies reach the World Series. His debut came at Cleveland’s Municipal Stadium on April 12. Ferraro gave André Thornton one of his infrequent starts at first base and made Culmer the designated hitter that afternoon. The 25-year-old rookie went 2 for 3, singling in his first and third at-bats against Rick Honeycutt. The Texas lefty, who had a good pickoff move, caught Wil straying in the seventh inning; the Rangers won 2-1. Fred Sturrup recalled, “After his first game with the Indians, he called me. He was elated and asked me to express his feelings to the entire nation.” However, Culmer’s hits that day were the only ones he ever got in the majors. He did have one sacrifice fly but otherwise came up empty in 17 plate appearances, which spanned four starts in right field as well as another at DH. The last game he played for Cleveland was on May 1; two weeks later the Indians sent him down to Triple-A Charleston as they activated Toby Harrah, who had recovered from a broken hand. Culmer rewarded his skipper’s faith to a degree, lifting his average to .245 with 7 homers and 29 RBIs in 87 games. Cleveland recalled Wil in early September but he did not see any action. In an unusual move, the Indians actually returned him to Charleston near the end of the month with five games still left on their schedule. In 1984, the Tribe had a new Triple-A club, the Maine Guides. Culmer started the season there as a reserve outfielder. He played in just 16 games with the Guides, though, spending a five-week stretch on the disabled list after jamming his thumb in a collision with Toledo’s second baseman. When he was active, he didn’t do much with the bat (.200-3-9) – though he did pitch nine scoreless innings in a long extra-inning game. In June, Cleveland sent him down to Double-A Buffalo, where his hitting was not impressive either (.256-2-26 in 56 games, playing first base and DH). Evidence has not surfaced as to whether he quit baseball or was released, but Culmer’s pro career had ended. Injury was the prime factor, according to his family. He then came home to the Bahamas and sought employment at the Crystal Palace Casino, which had also employed Tony Curry as a host. Ed Armbrister also worked in the gaming business, a staple of the Bahamian tourist economy. Culmer was a croupier, then a supervisor, and finally a pit manager. In his leisure time, he remained prominent in baseball and fast-pitch softball. He donated equipment and assisted in coaching at a local senior high school, St. Augustine College. On October 14, 2003, Culmer died at home from a hypertensive cerebral hemorrhage. At the time he was engaged to be married to Sharon Bethel. The couple had three sons: Wilfred H. Culmer III, Montenez, and Caleb. Fred Sturrup and other local columnists still celebrate the heyday of Bahamian baseball in their work. Wil Culmer’s name continues to turn up – and he has received another posthumous honor. In June 2011, the Ministry of Sports, Youth and Culture in the Bahamas announced Culmer as a member of the newest class in the National Sports Hall of Fame, to be inducted in October 2011. Special thanks to Wil Culmer III, Sharon Bethel, and Fred Sturrup in the Bahamas. Thanks also to Terry Pluto. Birth and death certificates for Wil Culmer. Eneas, Cleveland W. Bain Town. Nassau, Bahamas, Timpaul Publishing Co.: 1976. During his career, Culmer’s year of birth was listed as 1958. See Baseball Digest, April and May 1983; Sporting News Official Baseball Register, 1984. Jones, Denez. “A final tribute is paid to local baseball icon.” Nassau Guardian, October 26, 2006: C1. “Ex-Phil displays power,” Associated Press, March 22, 1983. “St. Joseph’s rich history.” Freeport News, January 9, 2009. Hamilton, Terry. “Culmer Gets Playing Time, Chance To Improve Defense.” Spartanburg (South Carolina) Herald-Journal, June 22, 1979: A10. Sturrup, Fred. “Colin Thompson, a star in his own right.” Nassau Guardian, April 17, 2009. Rosenblatt, Carl. “Peninsula Prowess Doesn't Always Translate.” Newport News (Virginia) Daily Press, August 19, 1990: C3. “Phils Add Four To Roster.” October 30, 1980. Feeney, Charley. “Pena’s hitting has Nicosia hearing trade rumors.” Pittsburgh Post-Gazette, March 24, 1981: 14. Kashatus, William C. Almost a Dynasty: The Rise and Fall of the 1980 Phillies. Philadelphia: University of Pennsylvania Press, 2008: 233. Stark, Jayson. “Reading Farmhand Culmer Has a Long Row to Hoe.” Philadelphia Inquirer, June 25, 1981: D1. Dietz, Doyle. “Culmer Augurs Better 2nd Half?” Reading Eagle, June 22, 1981: 45. Stark, Jayson. “Replacing Schmidt Not Easy, Phils Find.” Philadelphia Inquirer, April 17, 1982: C6. Pluto, Terry. “Denny Deal Raises Brows in Cleveland.” The Sporting News, September 27, 1982: 14. “Time Will Judge If Trade Winds Blew Fair or Foul.” Philadelphia Daily News, May 2, 1986. Pluto, Terry. “Culmer, Pagel and Velez Battle It Out.” The Sporting News, March 28, 1983: 44. Hackenberg, Dave. “Charleston’s Willard, Baller Best Bets For Tribe Stardom.” Toledo Blade, July 17, 1983: B3. Snyder, Bob. “Tidewater looks like team to beat as IL season opens Tuesday.” Syracuse Herald, April 8, 1984: C5. Biddeford (Maine) Journal, May 2, 1984; June 12, 1984.